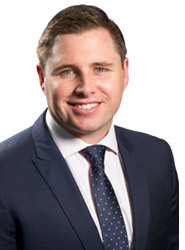 As the manager of our Sydney office, Patrick leads a dynamic young team who enjoy working closely together and solving problems as team and with their trusted professional partners. “I love working with and mentoring our younger members of staff,” says Patrick, “and I also really enjoy the diversity of the work we do. Patrick enjoys practicing in a wide range of areas, including commercial litigation, insolvency, commercial and property law and regularly appears on behalf of creditors, liquidators and registered trustees in a variety of insolvency matters in state and federal courts and tribunals. He provides advice on commercial property matters–including leases, property disputes and the sale and purchase of land—as well as on the sale and purchase of business, various financial agreements including loan documents, guarantees and other various securities. Admitted as a solicitor of the Supreme Court of Queensland, he has a Bachelor of Laws and Bachelor of Business (Accounting) from the Queensland University of Technology.